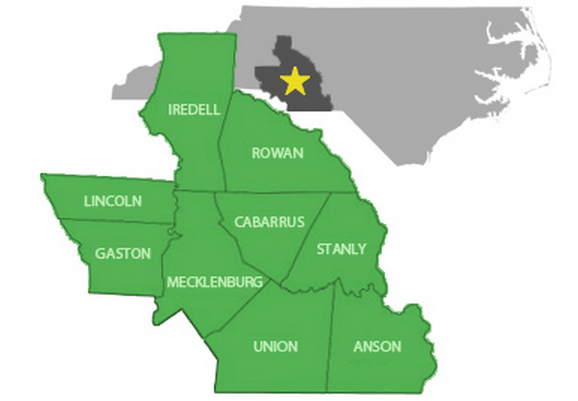 Centralina Council of Governments is located in the Central Piedmont of North Carolina and encompasses nine counties and 74 municipalities, representing almost two million people and headquartered in the City of Charlotte. That number is projected to grow to at least 3.5 million people 20 years from now. The Centralina region has been one of the most dynamic in the Southeast. Growth is spiraling outward from Charlotte and Mecklenburg County into surrounding counties following the completion of interchanges on I-485 in Southeast Mecklenburg County as well as an extensive public utility infrastructure network in Mecklenburg County. The I-485 interchanges gave regional residents significantly improved access to the Centralina region.